On Thursday, March 21, 2019, the Merced County Sheriff’s Office STAR Team in conjunction with the Merced Police Department’s Gang Violence Suppression Unit (GVSU) executed a search warrant in the 7000 Block of Tokay Circle in Winton, California stemming from an investigation into the large-scale possession and sales of Methamphetamine. Upon execution of the search warrant the primary suspect, Jorge Saucedo fled on foot from the residence and onto the roof of a neighboring house. Deputies and Officers set up a perimeter and Saucedo apprehended by Deputy Sparks and his K-9 Zeke while attempting to flee to a family members residence. 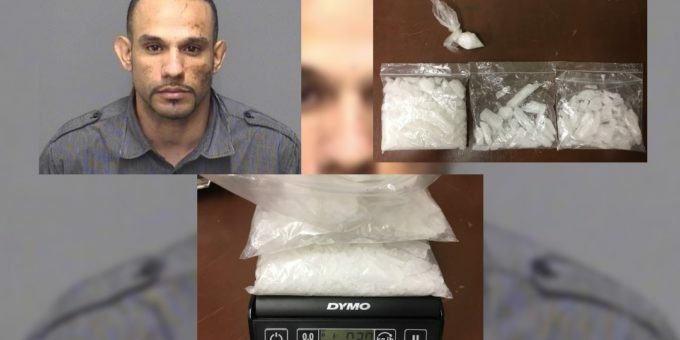 During the search of the residence, 1.3 pounds of methamphetamine was located in a bedroom believed to belong to Saucedo. Jorge Saucedo was booked into the Merced County Jail on charges of possession of a controlled substance for sale, maintaining a place for the trafficking of a controlled substance, and a felony no-bail warrant for possession of a controlled substance and a violation of probation. All information and photos from the Merced sheriffs department.